Massage Cupping is an ancient technique that’s found its place in the modern world of healing. Massage Cupping™ techniques are an incredible addition to massage therapy, physical therapy, facials and body treatments. The action on the nervous system is sedating, and people often descend into a profound state of relaxation. On a deeper therapeutic level, Massage Cupping™ therapy is very beneficial for many conditions such as high blood pressure, anxiety, fatigue, chronic headache, fibromyalgia and neuralgia. Body contouring with cupping can eliminate cellulite, and contracted, congested muscle tissue will soften quickly with only a few minutes of Massage Cupping™bodywork. Larger cups are used for the broad areas of the back, and a strong vacuum will mimic the rolling action of deep tissue massage without the discomfort. The movement may be long and draining or circular and stimulating for stubborn knots and areas of rigid tissue. The skin will turn very red with strong suction, indicating that the circulation has been brought to the surface. Application of liniments, analgesics, plant hydrosols and essential oil blends immediately after the cupping will enable the absorption of the product deep into the tissue. The increased local blood supply to the muscles and skin will bring nourishment and allow for toxins to be carried away via the veins. The sensation is truly indescribable! People often describe a deep warmth, and a tingling sensation long after the treatment has ended. Massage Cupping™ therapy is not an irritant to the skin or body. It draws the inflammation out, yet does not add to it. This technique is excellent when used as a contrast therapy with warm or cool compresses, or liniments. Massage Cupping™ techniquescan be used to mimic other massage techniques without the normal stress on the hands of the therapist. Another profound application of Massage Cupping™ therapy is for the treatment of cellulite. 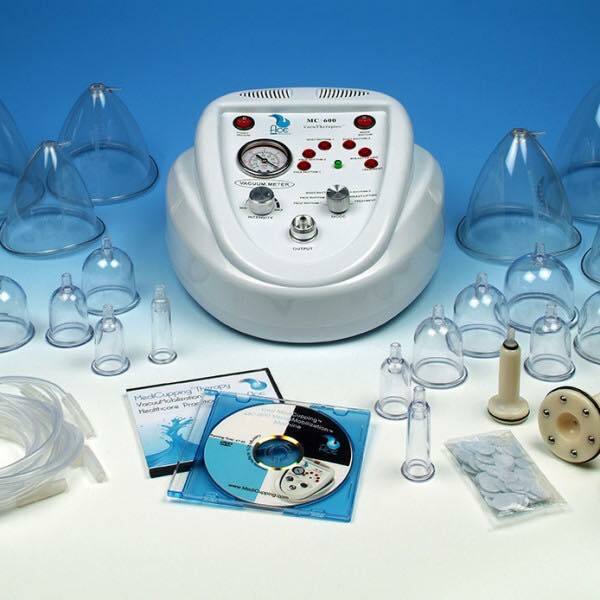 The spa industry has many fine pieces of equipment to choose from, and Massage Cupping™ performs many of the same functions manually. A very light suction provides drainage, while heavier application can be used to stimulate circulation and loosen adhesions or “dimpling”. The thighs and hip region should be treated prior to a wrapping procedure to enhance the absorption of product. The temperature of the wrap will be kept lower and more comfortable since circulation and drainage has been stimulated through Massage Cupping™, while solidified deposits have been softened for easier elimination. Successful and enjoyable body sculpting and contouring is possible, with lasting results and many health benefits.